Over at Nature at this LINK. Why is the presence of steppe admixture in Mycenaeans important? And why does it matter if the Minoans already had a lot of ancestry from the Caucasus or surrounds? Because Mycenaeans were Indo-Europeans and Minoans weren't. I'm still reading the paper and will update this entry regularly over the next few days. Below is the abstract and, in my opinion, a key quote. Emphasis is mine. The origins of the Bronze Age Minoan and Mycenaean cultures have puzzled archaeologists for more than a century. We have assembled genome-wide data from 19 ancient individuals, including Minoans from Crete, Mycenaeans from mainland Greece, and their eastern neighbours from southwestern Anatolia. Here we show that Minoans and Mycenaeans were genetically similar, having at least three-quarters of their ancestry from the first Neolithic farmers of western Anatolia and the Aegean [1, 2], and most of the remainder from ancient populations related to those of the Caucasus  and Iran [4, 5]. However, the Mycenaeans differed from Minoans in deriving additional ancestry from an ultimate source related to the hunter–gatherers of eastern Europe and Siberia [6, 7, 8], introduced via a proximal source related to the inhabitants of either the Eurasian steppe [1, 6, 9] or Armenia [4, 9]. Modern Greeks resemble the Mycenaeans, but with some additional dilution of the Early Neolithic ancestry. Our results support the idea of continuity but not isolation in the history of populations of the Aegean, before and after the time of its earliest civilizations. The simulation framework also allows us to compare different models directly. Suppose that there are two models (Simulated1, Simulated2) and we wish to examine whether either of them is a better description of a population of interest (in this case, Mycenaeans). We test f4(Simulated1, Simulated2; Mycenaean, Chimp), which directly determines whether the observed Mycenaeans shares more alleles with one or the other of the two models. When we apply this intuition to the best models for the Mycenaeans (Extended Data Fig. 6), we observe that none of them clearly outperforms the others as there are no statistics with |Z|>3 (Table S2.28). However, we do notice that the model 79%Minoan_Lasithi+21%Europe_LNBA tends to share more drift with Mycenaeans (at the |Z|>2 level). Europe_LNBA is a diverse group of steppe-admixed Late Neolithic/Bronze Age individuals from mainland Europe, and we think that the further study of areas to the north of Greece might identify a surrogate for this admixture event – if, indeed, the Minoan_Lasithi+Europe_LNBA model represents the true history. Update 05/08/2017: Much like Lazaridis et al., I ran a series to qpAdm analyses to find the best mixture model for the Mycenaeans. 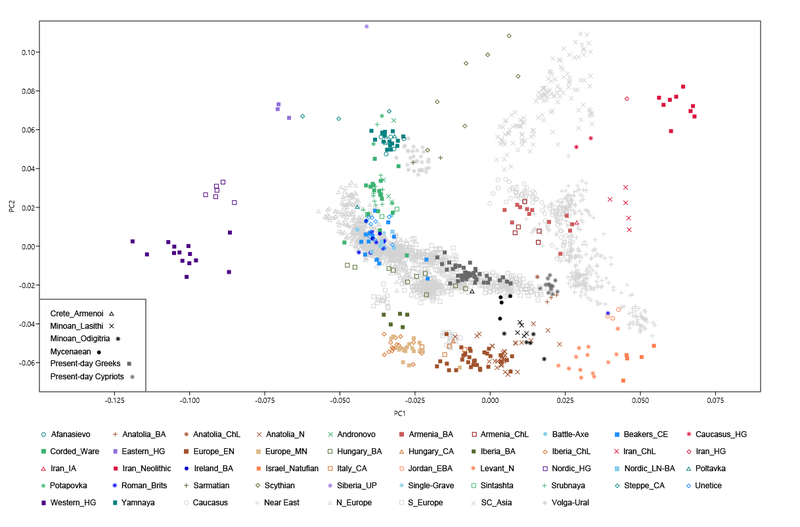 However, just to see what would happen, unlike Lazaridis et al., I didn't group any of the archaeological populations into larger clusters based on their genetic affinities. The three models below stood out from the rest in terms of their statistical fits. So it's essentially the same outcome as the one obtained by Lazaridis et al., because Sintashta and Srubnaya are part of their Steppe_MLBA cluster, while Corded Ware is part of their Europe_LNBA cluster, and it's these clusters that, along with Minoan_Lasithi, provided their most successful mixture models for the Mycenaeans. But it's nice to see Sintashta at the top of my results, because it fits so well with the long postulated archaeological links between Sintashta and the Mycenaeans (for instance, see here). By the way, here's what I said back in May when the Mathieson et al. 2017 preprint came out (see here). So things are falling into place rather nicely. This guy is the most Yamnaya-like of all of the Balkan samples in Mathieson et al. 2017, and, as far as I can see based on his overall genome-wide results, probably indistinguishable from the contemporaneous Srubnaya people of the Pontic-Caspian steppe. He also belongs to Y-haplogroup R1a-Z93, which is a marker typical of Srubnaya and other closely related steppe groups such as Andronovo, Potapovka and Sintashta. So there's very little doubt that he's either a migrant or a recent descendant of migrants to the Balkans from the Pontic-Caspian steppe. Yay! J2a1h-M319 in Minoan context. Feeling confirmed. The authors are still agnostic as to the direction of the admixture of the steppe component in Mycenaeans. Their models can't distinguish between admixture from the north via the Balkans vs from the East via Armenia or surrounds. Personally, I find admixture from the north more likely. Also of note is the lack of detected Steppe admixture in the Bronze Age Anatolians from the Southwest region. Authors suggest steppe admixture could have been diluted over millennia if it indeed entered at an early date of around 4000 BCE. More sampling is needed to resolve the Anatolian question. Interesting observation made by the people at Molgen: most of Mycaeneans are from ordinary burials, and the most EHG-shifted sample - Crete_Armenoi - is from an elite burial, postdating Mycaenean infiltration to Crete. So, perhaps Mycaenean elite was more EHG-shifted, compared to ordinary people. Of course more data needed to tell whether it's true or not. That's it. Debate over, Indo European languages are from Steppe. @ Rozenfag, certainly a possibility. Or could just be structure in level of steppe ancestry in Mycenean population with some regional populations having more and some less. On this sample, I think the table S2.7 model for the sample is unusual though - 22% EHG, 78% Anatolian_N. Seems like from position on PCA should only have 2.5x on the vector Minoan->Mycenean, or approx 12% EHG / 25% Steppe_EMBA. Enough with the trolling in this thread. I've had to delete several comments already. I know this paper is a shock to some, but please try and be objective. The Caucasus influenced Minoans are clearly the pre-Indo-European substrata population in the region. So Y-HG J was pre-Indo-European. The amount of steppe ancestry is already enough as it is, because it gels with archeology showing that the Mycenaean elites had strong links to the steppes. Another ten samples from elite burials, and you'll see R1a-Z93 pop up and plenty more EHG admixture. "Interesting observation made by the people at Molgen: most of Mycaeneans are from ordinary burials, and the most EHG-shifted sample - Crete_Armenoi - is from an elite burial, postdating Mycaenean infiltration to Crete. So, perhaps Mycaenean elite was more EHG-shifted, compared to ordinary people. Of course more data needed to tell whether it's true or not." The paper states that the elite Mycenean burial itself did not differ from commoners in terms of EHG admixture. @Rob, good spot. Worth Rozenfag to mention, but I guess we need to be wary of a simple explanation when it could be easily contradicted. (Thinking about it, from the same data I could have launched into viewing this female as a high prestige "Balkans Bride" bought into the culture by a late Mycenaean aristocrat. Compelling as an image, but going a bit beyond the evidence!). IRC the Balkans transect resisted any kind of elite / non-elite association with steppe ancestry. Yes on balance, I'd say that PIE arrived to Greece from the north rather than directly from East. Of course, some of the complexities of the global picture need final resolution. Now, the elite burial... much more steppe..and MN Europe... like LNBA Northern Europe. makes me wonder how more male samples and likely R1 would look..
Definitely looks like Greek came from Eastern Europe and not West Asia. @Chad, they have some qpAdm models with Minoan+Steppe_EMBA that work out around 13%, so that 14% model looks pretty within range. Also for all, there's an interesting new modeling technique on page 46 Extended Data Figure 6, using a different kind of simulation than qpAdm does. Might be worth trying to get our heads around (and assume may be in next release of Admixtools). "The simulation framework also allows us to compare different models directly. Suppose that there are two models (Simulated1, Simulated2) and we wish to examine whether either of them is a better description of a population of interest (in this case, Mycenaeans). We test f4(Simulated1, Simulated2; Mycenaean, Chimp), which directly determines whether the observed Mycenaeans shares more alleles with one or the other of the two models. When we apply this intuition to the best models for the Mycenaeans (Extended Data Fig. 6), we observe that none of them clearly outperforms the others as there are no statistics with |Z|>3 (Table S2.28). However, we do notice that the model 79%Minoan_Lasithi+21%Europe_LNBA tends to share more drift with Mycenaeans (at the |Z|>2 level). Europe_LNBA is a diverse group of steppe-admixed Late Neolithic/Bronze Age individuals from mainland Europe, and we think that the further study of areas to the north of Greece might identify a surrogate for this admixture event – if, indeed, the Minoan_Lasithi+Europe_LNBA model represents the true history." I can play with this some more to improve the fit. That was the elite female ^^^ much more Steppe. I could try though with the female elite from Crete. ^^ Something like 29% Steppe_MLBA which would work out to 27% Steppe_EMBA / 13-16% EHG makes more sense than their basic model of her having 22% EHG at any rate. Can you isolate the elite Mycenaean from the tomb at Peristeria, which Rob mentioned (http://i.imgur.com/nlQHMWu.jpg) and test that one. Thanks and look at the elite female now!! Much better and a lot of steppe input. What is the sample ID??? Looks like Greek from the steppe.. can't see this any other way..
That's a lot of steppe ancestry for a Cretan.. I'll have to mess with the pright to bring down those errors on the West Asian side though. I'd say that PIE arrived to Greece from the north rather than directly from East. Alberto, what are your thoughts? Archaeologists estimate the age of the settlement at between 1,750 and 1,690 BC. “This direction contacts of at least some of the prehistoric inhabitants of ‘Zyndram’s Hill’ has already been indicated by previously discovered fragment of a stylized human figurine – so-called violin idol. Such statuettes were produced in large amounts in Mycenaean Greece, and Northern Balkans” – he added. Thanks for that surface-stuff few posts earlier. "I'd say that PIE arrived to Greece from the north rather than directly from East." Of course, we'd like confirmation with (more) uniparentals given the multiple potential possibilities with autosomal permutations. A Better fit.. she looks 50% Bell Beaker, 50% Minoan.. interesting. Interesting work Chad. I guess it goes with her being U5a and quite late on in the piece (1350 BC). Would you say Myceneans were importing steppe wives, and cattle ? Great to see steppe admixture in Bronze age MycMycenaens. But do Mycenaeans have any WHG admixture? Or do they have more EHG ancestry than modern Greeks but less WHG? Apparently, they also imported their male elites from the steppe too, because their grave trappings look like those of Sintashta elites. It's pretty obvious what we'll see when these guys from the Sintashta-like burials are finally genotyped. "Apparently, they also imported their male elites from the steppe too, because their grave trappings look like those of Sintashta elites. It's pretty obvious what we'll see when these guys from the Sintashta-like burials are finally genotyped"
Agree. it would be obvious when R1a-Z93 turns up c. 2000 BC. It would be great to perform some comparisons between modern Greeks and Myceneans to find out the contribution from the Middle East in the historic period, which appears substantial, in addition to whatever slavic ancestry arrived. "The Caucasus influenced Minoans are clearly the pre-Indo-European substrata population in the region. So Y-HG J was pre-Indo-European." Makes sense Y-HG J was pre-Indo-European, but according to Eupedia, a great deal of Y-HG was G2a. Any thoughts? Thanks in advance. Now that we have concrete evidence of steppe ancestry in Crete during the bronze age, I think a case can be made for the Philistines to be a possible source of the steppe related ancestry in the modern Lebanese from Haber 2017. Historical and archaeological evidence points to the Philistines being from Crete or at least the Aegean. Philistine pottery has been found to derive from the Mycenaean Helladic IIIC style. I don't have any time for your ramblings in this thread. Take it elsewhere. There were multiple non-IE waves from Anatolia into SE Europe during the Neolithic, the earlier waves were dominated by G2a and the later waves, which gave rise to the Minoans, by J. Look out for R1 in the early Mycenaean period when more samples come in from Greece. By the way, I have the data and I'm integrating it into my datasets. Once I have everything set up I'll be posting a lot of analyses, including of modern-day Greeks. Is the Anatolia BA also available ? I've got mine all merged with the HO set. Greek samples are limited in this though. I'll have to pull some from other Harvard sets. So basically Minoans were Anatolian/Agaean farmer + CHG, while Mycenaeans were 82% Minoan like + Steppe(Yamnaya). Hmm.. Kumtepe4 sits 1/3 of the way between the other CA Anatolian and LN/EBA Euros too. Modern Greeks appear to have 13%-20% Yamanaya-steppe admixture. How steppe were the Mycenaeans? "while Mycenaeans were 82% Minoan like + Steppe(Yamnaya)." Mycenaeans had 18% steppe admixture? The PCA says Cypriots are actually the closest of all modern population to Bronze Age Greeks. Back from a mini-vacation of sorts and, sure enough, there was a pleasant surprise waiting for me! As I had predicted, the Mycenaeans were not steppe-heavy. It looks like they also had separate Irano-Caucasus related admixture. This component overlaps w/steppe in its alleles, as we all know. Another confound for f stats, of course, is Armenia MLBA's steppe, of which the authors reminded us. As such, none of the formal stats was a bona fide smoking gun. If Armenia MLBA was the sole source of the steppe in Mycenaeans, an imaginary line connecting Neolithic Greece and Mycenaneans would intersect the Armenian cluster. Instead, it is angularly tilted in the Euro-wise direction. Aside from distance issues, this scenario isn't even that parsimonious anyway because it would entail virtually undetectable levels in steppe in Mycenaeans. Obvious reason for this: dilution. Mathematically speaking, only a complete replacement by Armenian migrants would allow Mycenaneans to have comparable steppe ancestry to Armenia MLBA if Armenia was the only source. Needless to say, this wasn't the case. The Armenoi sample from Crete IS somewhat of a smoking gun, though. Judging by how it's shifted relative to the other Minoans, as well as to Neo Greece and Mycenae, it obliterates the Armenian hypothesis w/respect to early steppe ancestry in Greece, screaming towards a Balkan direction. OF NOTE, the Armenoi sample POST-DATES all other samples in this study. Even if it was an elite burial, it raises the possibility of intuitively significant increases of steppe ancestry in Greece shortly before and through the Homeric period(Greek Dark Age). The Armenoi sample might reflect the Dorian Greeks who were concentrated in Western Crete and may have been a separate more recent movement from the Balkans into the Peloponnese and Crete. That would fit with her higher steppe ancestry. Mycenaean/Linear B most closely resembles Ionian Greek or Arcado-Cypriot Greek. Note that many consider that Minoan Crete was multilingual with Linear A (typologically prefixing and syllabic reduplicating) across the island and Eteo-Cretan (suffixing/agglutinative) in Eastern Crete/Lassithi where the J2a1h-M319 sample was found. Perhaps the G-P303* in Herakleion prefecture tracks Linear A and relates to the Neolithic language(s) and the J2a1h more tracks languages like Hurrian from the East--Armenia and Iran. The Global 10 sheets have been updated with the new Greek samples, and the new Anatolian, Iranian etc. ones too. Please note however, that I removed most of the English Anglo-Saxon and Iron Age samples for the time being, because they were producing inconsistent results, but will replace them very soon. Neolithic Balkan Farmers already had EHG prior to arrival of CHG. Would like to see models of Mycenean using this. No they didn't. They had a bit of something resembling SHG, which wouldn't explain the Mycenaean results. I decided to depict, with a few assumptions, what I consider to have been the MOST LIKELY turn of IMPACTFUL events in peninsular Greece over the centuries. First stage(culminating in a Minoan-like population): Influx of Chalc_Anatolia-like ancestry. Blue dotted line shown projecting in that direction. Second stage(culminating in a Mycenanean-like population): influx of Balkaners carrying steppe ancestry. Third stage(culminating in Armenoi):further influx of steppe ancestry from the north. Blue dotted line shown projecting towards some mystery Balkan population. Fourth stage(not shown; culminating in modern Greeks):further influx from the north and/or Slavic invasions. @Rob Thanks I'd be very interested in your comments. I wouldn't worry about what the BBC has to say about this. @Chad: What is the sample ID??? ("Female without an osteological age estimate, 1416 – 1280 calBCE (DEM-2903 (MAMS-25207), 3084 ± 24 bp)."). @MaxT / Archades: 82% Minoan like + Steppe(Yamnaya). Final estimate in paper Mycenaean samples have Steppe_EMBA admixture 13%. Less than present day Greek average, or at the lowest end estimate. 17% only present when using Steppe_MLBA. But if you used that, modern Greeks would have *way* more than 17%! Modern Greeks->more Steppe_EMBA ancestry than Mycenaeans. 1x sample may be comparable (but probably not greater) in Steppe_EMBA ancestry - an elite female from Cyprus. However, 1x elite female sample from Peristeria_Tryfilia exactly the same as all other Mycenaean samples. Note, this is not because the samples all came from one site. This genetic composition for Mycenaeans is general to different sites in the Peloponnese (likely inc. Mycenae). Mycenaeans had sites in Central Greece and Thessaly also (https://en.wikipedia.org/wiki/Mycenaean_Greece) so those may have had a subtly different genetic composition. Possibly with more Steppe related ancestry. Also modern Greeks have different levels, so possible modern Peloponnese Greeks have same / less Steppe ancestry than Mycenaean Central Greeks (if we ever get samples to compare). @ AnthroSurvey: If Armenia MLBA was the sole source of the steppe in Mycenaeans, an imaginary line connecting Neolithic Greece and Mycenaneans would intersect the Armenian cluster. Instead, it is angularly tilted in the Euro-wise direction. Their models fit PCA for the population centroid in either model: http://www.nature.com/nature/journal/vaop/ncurrent/fig_tab/nature23310_SF5.html. Though Mycenaean samples only dispersed on East-West axis, not North-South. It's not unlikely that you have multiple ongoing admixture sources into populations on a crossroads. Either model, whether Anatolia_N+Armenia based or Minoan+Steppe/LNBA requires some trace admixture from either Steppe / Armenia to work. Both populations with CHG and EHG in varying proportions seem to be overlapping and expanding during Bronze Age. So majority from one of Steppe_EMBA / Armenia, trace from another is possible, or medium sized fractions of both, all depending on appropriate predecessors for Mycenaeans. PCA is only a check here though. They do have formal methods. @ All - http://imgur.com/a/EvvSW. Few crude overlays of this PCA with the Mathieson 2017 PCA, for anyone's interest. I added all the latest samples that Davidski have been posting for Global 10 to a generic run that I did a while back. Good to have it as a general reference, though I'll be looking at more specific models in the near future. I still didn't have time to look carefully at the paper, so I'll comment about it a bit later. In any case, I think you're asking because of some comment I once made about people suggesting that Mycenaean civilization was an offshoot of Srubnaya culture (and ultimately from CCW) had lost their grip on reality. And I guess in this case the results speak for themselves about this specific question, so not much to add about that. Minoan, Anatolian_Chalco(stemming from a potential ongoing influx of proximal, CHG-shifted Anatolians), and Europe LBNA. Would you be able to try it out if/when you have a chance? Also, do you think the PCA and ADMIXTURE results of Kum4 make sense? As far as I remember, it was a pretty low-coverage genome(~0.01x). To me, it seems off when we take together its time-frame as well as Kum6, Chalcolithic_Anatolia or Balkan genomes from Mathieson. Excellent paper. Unfortunately just one Y DNA from Mycenean period. The Mycenean sample is not negative for J2a1b which means that it can still be J2-M67*. J2-M67's ultimate origin is most likely somewhere around Armenia, but offcourse this doesn't mean automatically that proto-Greeks had West Asian origin, because it could be there from Minoan period. Also it should be added that in Voskeridas paper J2-M67 showed as good correlation in spreading Greek language to Cyprus as R1b-M269, so it's presence in Mycenean context makes sense. Absence of E-V13 in Bronze Age Balkans and Greece on the other side is very puzzling. The Greek results make sense. (i) A large portion of continuity from Late Neolithic Greece, (ii) a large impact from baden-Boleraz-type cultures ("hungary_CA"), and Armenia EBA (27%)- the archaeologically documented "Royal Road" from Caucasus - West Anatolia - Greece. "Nevertheless, considering their overall trend as well as the admix modeling and the PCA, we have ourselves another winner. :-) Exciting times we're living in. Gimbutas must be in seventh heaven by now. :D"
Before I reply, were you being Ironic ? Or do you actually think Gimbutas' ideas hold today, after all the advancements in finds and re-calibration of dating (making some of her dates 1000 years out, thus rendering cause-and-effect potentially backward). Eric Hamp had proposed a migration of Greeks from Steppe to Greece via West Asia (crossing Caucasus). But his proposition didn't gain much acceptance. Also Anthro Survey explained quite well why this type of migration is unlikely from genetic point of view. That Anatolia BA J1a is most probably a J1-Z1828 the European branch. The simultanous presence of CHG and Levant means it came from a place which is between Caucasus and Levant. Needless to say what is the name of that place. So the Out of Mesopotamia is oversimplification! It can be true for J1 P58, but not for other branches like Z1828 who are rooted in North Near East. This is the European branch of J1a which has very little to do with Mesopotamia. Btw on Molgen some commentators predicted it's presence in BA Anatolia a while ago. ""Mathematically speaking, only a complete replacement by Armenian migrants would allow Mycenaneans to have comparable steppe ancestry to Armenia MLBA if Armenia was the only source. "" But offcourse things can be more complicated. So one source model is not realistic. I would like to hear other opinions because I am just starting to read. Oops this particular sample seems to be negative to Z1828 but it doesn't mean much because other samples could be positive. Also it is not mentioned to be positive for P58. Modern Armenians are Armenized Mesopotamiams who went North to escape the moslem expansion. They cannot be told apart from Iraqi Jews from Baghdad, unlike Bronze and Iron age samples from Armenia. Those results are very very standard and predictable. Btw, closest pops to Mycenaean. I like it. Steppe seems somewhat inflated, though. Can you do Iberians and Basques/SW French using this same setup as control results for extra-WHG ancestry? I'd also be curious to see their SSA+Levant score corresponding to minor Berberic admixture. Not in the least bit. Granted, some--many---of her trees had to be chopped down, but the forest still stands. Maybe I misunderstood, but why don't you buy Ari's "Barcin" figures? Remember that not all of it is DIRECT Barcin and some arrived in a package w/"Satsurblia" from Chalco-era Anatolia. Direct Barcin is probably closer to ~50% or so in Minoans once we do the relevant subtraction. The BBC story is worth reading and particularly the following paragraph. The story is at the following site. Lazaridis et al. have themselves not taken a strong stand on whether the steppe-related ancestry in the Mycenaeans is actually from the steppe or instead from Armenia. So there may well have also been a Southern route that Indo-European languages took into Europe. I was going to say - I do agree that, overall, such amount of Barcin ancestry is correct. That actually is ~ 75% Barcin, but more probably realistic to the reality of the Bronze Age, because in a very specific sense, Myceneans do not (75%) directly- descend from the the population of Neolithic Barcin/ Mentese, but from a ?3 -way blend of more recent predecessors. G2a -3; I2a2- 4; H2 - 1, J2a - 3; J2b - 1; R1a-Z93 - 1. Yes, I think Gimbutas was right about a migration from the steppe to Northern Europe. .. Very clean. So the main difference seems to be a one of degree - a far greater continuity with local Neolithic; and no Baden-Cotofeni stuff. Just to prove my point: I did a run with just source choices which existed c. 7000 BC. One thing that struck me about the recent Portuguese BA paper was its sloppy conclusions about language "survival". Mostly because of the lack of any scientific methodology in their assumptions. In Iberia there was a massive turnover in the Y chromosome, and those Portuguese samples 3 out of 3 were R1b. But they didn't show a large steppe admixture (as measured taking samples from Yamnaya), so that "explained" the survival of non-IE languages in Iberia. Apparently, that male mediated migration that was acquiring female mediated local admixture as it advanced, was causing a language shift (assumed to be IE, with no proof) everywhere, but for some reason the same phenomenon didn't work for Iberia, where language "survival" was female mediated. Or maybe the authors just don't know basic geography and didn't care to look at a map of Europe to see where is Samara, where is Germany and where is Portugal. And it all begins with the assumption (far from proved) that R1b-L23 came from steppe EHG, and that the ~50% CHG-like admixture was female mediated and has no implications for language shift (as the ~55% Europe_MN admixture in Bell Beakers was also female mediated and didn't affect the spread of IE languages (again, IE assumption based on zero facts). Oh well, in Iberia we do have plenty of evidence of non-IE languages in large and presumably high R1b areas, but it doesn't matter, because in that case it was the wives who imposed the language to the these R1b males. Whatever. So why are "scholars" bending the data at will to fit a preconceived hypothesis? Is that how science works? And something that worries me a bit more, why are people who read the papers so willing to accept it and lack any critical thinking? Why didn't anybody complain about that flaw? All this is because I'm seeing the same thing here once again. We finally get samples from early and attested IE speakers and magically a small amount of "steppe" admixture (without any proof of it being even male mediated, rather the contrary based on one sample plus the Mathieson paper) proves that it brought a language shift. And everyone makes an effort to try to figure out how to increase that ~11% figure or prophetize about future samples from elite burials. How about looking at the data and accepting it as is? How about moving with it? How about thinking about the different possibilities? We are still far from knowing the truth, but whenever we get new data we get a step closer. Now we're closer than ever before. So you see, this is what the data shows. A negligible amount of EHG in Mycenaean Greeks, but a very substantial amount of CHG-related admixture. Won't you simply accept this reality and abandon your previous expectations in favour of the real facts? Try to get the same results without AG3. There is Yamna in that run, you are just hiding it with AG3, a 24000 year old damaged sample. 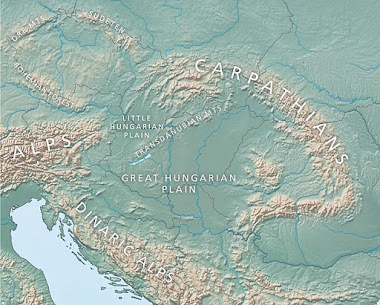 Farmers from eastern Europe are suspect of early EHG elements. I still get lot of Yamna with farmers from western Europe. Regarding the Indo-European homeland question. Some scholars have suggested that the Minoan language is Indo-European, related to the Anatolian IE languages like Luwian. It is not 100% certain Minoan is non Indo-European. Considering the Bronze age samples from Anatolia do not have steppe ancestry then its still possible Minoans spoke IE and PIE is not ultimitely from the steppe..since Minoan and Anatolian samples show no EHG ancestry. Mycenaeans on the other hand have steppe and EHG ancestry so Greek can be just steppe derived. The steppe could explain all IE languages aside from Anatolian..but the steppe would not be actual PIE. My point is we need confirmed IE speaking Anatolian samples like Hittite elites or Luwians to show steppe and EHG ancestry if the steppe model wants to be victorious with certainty. Because im seeing CHG ancestry everywhere including Bronze age Anatolia. I dont think using Armenia EBA is a wise choice. It isn't very proximate compared to the Anatolian BA. The Anatolian BA does not have much if any Armenian admixture. Its way too southern shifted. This period has movement from around Mesopotamia. Only thing that makes sense is Northern admixture. Can you guys please stop posting your nMonte models and arguing as if they mean anything? They don't. Especially the weighted ones. I'm sorry, but you can't argue anything based on that method. It's just there as a means to reproduce known models from other methods. Wow, after reading that BBC story I've totally changed by mind about the PIE homeland. I guess all those CHG/Iran_ChL Y-HG J-rich populations like Minoans, ancient Egyptians, Canaaties, etc. were all Indo-Europeans. Yamnaya and Corded Ware were Uralics. And we're writing in a Uralic language now. "I dont think using Armenia EBA is a wise choice. It isn't very proximate compared to the Anatolian BA." Why should we assume BA southwest Anatolia should be the same as Armenia EBA, or Myceneans ? Only stiff & unrealistic models assume any linear progression of relatedness. Areas in between could be distinct, to more distant areas which share some common ancestry. Yes I do not presume it's anything definitive, but one has to ask why it squares with all the other lines of evidence, and agrees when tested for other groups we already know. related to Neolithic Levantine populations. " That's what I showed. And the paper words things carefully. "Try to get the same results without AG3. There is Yamna in that run, you are just hiding it with AG3, a 24000 year old damaged sample"
"are pretty much in line with the conclusion of this paper (Minoans=EEF+CHG, Mycenaeans=Minoans+10%steppE"
The line from Anatolia EN to BA does cross Armenia CA to BA at a point that could likely be Mesopotamian. They pull towards the same area. This is a possibilty. I'd keep an open mind to it. Greece happens to be in Eastern Europe. No one is proposing a migration of Iberia_EN to Greece. And if by "a lot of Yamna" you mean that 7.3% that's ok, I won't argue against that model (that still has 18.7% Satsurblia and 9.7% Levant_N). Take is as you want. Maybe you can check on a map where is Greece, Armenia and Samara. I do find it strange though that you have no complain about using Satsurblia but you do with using Armenia_EBA. Does is really matter? I understand you didn't expect these results, but you're always telling people to move with the data. Just do the same. I never used Satsurblia. I don't understand what you're getting at. Anyway, it looks like Anatolia BA and Armenia EBA shift to the same population from their predecessors. I think that's important. Mycenaeans do look like they have ancestry that cant be explained by Hungary and Armenia. Also, we only have one Mycenaean ydna. When we see more, I'm certain we will see lineages that show steppe admixture is the way to go. "Also, we only have one Mycenaean ydna. When we see more, I'm certain we will see lineages that show steppe admixture is the way to go." Im sure as with more and more samples, a diversity will develop. Like northern Greece would be interesting, but that's not really Mycenean . Interesting results to me, above all that no R1b (neither R1a) has been found, but none of you thought that Lazaridis (above all for what has been said about him and his origin) could get a special magnet for Y hg. J (above 2) and that someone in the past said and wrote that IE diffused through that haplogroup? True, but I think even Mycenaean males will show the diversity on the autosome and Y when they come. We only have one to go by. Nothing groundbreaking I think. A connection of, at least southern/eastern, Greece and especially Crete (almost definitely the Aegean too when it's sampled) to Bronze Age Anatolia and then a population likely coming from the Balkans carrying some steppe ancestry. Both were very accepted possibilities in archaeology and linguistics and discussed on previous posts on here and for the time being this seems like the best explanation for these data to me. The other elite sample from the Peloponnese was similar to the non-elite samples as mentioned. 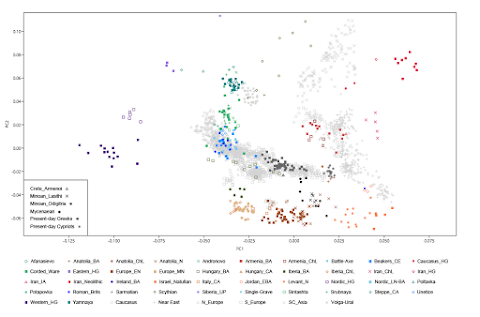 More samples would be welcome for sure but even the 4-16% or 13-18% steppe ancestry in the paper, based on the method, is plenty to connect the linguistic change to the steppe and an arrival from the north I think. Sakellariou for example, whom they reference in the linguistic part, thought the archaeology pointed to the steppe population being accompanied by a Balkan one while migrating to the south so the dilution is nothing extraordinary. Drews, while preferring an arrival from Anatolia and a more extreme elite change/rapid take-over scenario, thought the migration population might have been ~10% of the total. It's in the line with the rest of the Balkan data steppe-wise too; we might find a sample here and there with higher admixture like in that case. And congrats on Roy for his very early J2a subclade (2008?) prediction. Also my best guess for the time being is that Mycenean R will likely be R1b-Z2103. I also like their linguistic discussion that mentions the possibility of a very early steppe intrusion into Anatolia and dilution over time, unlike the protestations of some in those earlier discussions that were absolutely sure Anatolian in Anatolia must be very late and intrusive right before its first attestation due to a lack of steppe ancestry. But of course we need more samples from there too, as they mention in the paper. @Arza, violin figures were pretty common in the Near East and, more relevant, in the Cycladic long before those dates. The article is vague but unless you're positing some common steppe origin for both I don't see how it's that relevant. I'm curious if anyone has anyone tried to directly connect Greek to Corded Ware or post-Corded Ware cultures in that area even with some limited Corded Ware findings in the south? Also, as far as I know, Beakers directly are irrelevant to Greece specifically as well but some BB-influenced cultures like Cetina (plus the R1b-2103 found in Vucedol?) that directly impacted Greece could make sense, past the general genetic connections the steppe groups moving West/Southwest might have. I think it was Rob who brought up a potential Vucedol-Cetina 'bridge' in the previous discussions as one possibility, actually? But we'll see with more Y-DNA. Yes there seems to be at least an Archaeological connection between Vucedol, Wietenburg and Mycenaeans. if PIE started making a nuisance of themselves but weren't yet strong enough to physically invade their neighbors then their first big impact might be some of their neighbors moving away from them - a kind of domino effect. "Yay! J2a1h-M319 in Minoan context. Feeling confirmed". But what does mean having found at Crete (4000-3700 years ago) a sample of J2a1d-M319* (i.e. negative for Y16817, Y29889, Y5009), formed 13400 years ago as to YFull and with subclades separated 12000 years ago? Certainly it is a new subclade different from all the known ones. Are you ready to bet with me about the origin of hg. J2? I give you Caucasus, Iran (Middle East is useless, because certainly it wasn't there 12000 years ago) and I take only Europe? Actually there is a sample from Mexico (YF08857). There is someone ready to bet about a "CryptoJew"? "One thing that struck me about the recent Portuguese BA paper was its sloppy conclusions about language "survival""
one relatively simple explanation for some of these anomalies is if a minority of men arrive in a pre-existing culture, adopt the native language and then at some later time become dominant - this scenario would explain very little change apart from the ydna. (although another option for Iberia imo might be copper workers with good access to Cornish tin getting first dibs on high quality bronze swords). "And it all begins with the assumption (far from proved) that R1b-L23 came from steppe EHG, and that the ~50% CHG-like admixture was female mediated and has no implications for language shift"
i don't know if it fits the data but it does seem logically plausible to me that PIE might have caused a domino effect such that populations originally adjacent to PIE got away from them by invading peoples further south - then later PIE catches up with them. Mycenaean have more CHG and Eastern Paternal DNA J2a . Link with J2 and Indo-European is directly confirmed. "A Better fit.. she looks 50% Bell Beaker, 50% Minoan.. interesting." @Salden, @David - "The PCA says Cypriots are actually the closest of all modern population to Bronze Age Greeks." Not sure why you discount that David? We don't know a lot about Eteocypriot but what we do know seems to suggest it is closely related to Minoan and Eteocretan. LINGUISTICS AND GENETICS GO TOGETHER? Organized by Wolgang Haak, Guus Kroonen, and Philipp Stockhammer. Session 410 LANGUAGE IN EUROPEAN PREHISTORY Organized by Winfrid Scutt and Otto Marcel. Session 34 NEW APPROACHES TO HUMAN MOBILITY IN 4TH AND 3RD MILLENNIUM BC IBERIA Organized by Antonio De Valera, Catherine Freeman, Rachel Wood, and Lizzie Wright. Session 405 CATTLE-BASED AGRICULTURE IN CENTRAL EUROPE - INTRODUCTION, SPREAD AND IMPACT. violin figures were pretty common in the Near East and, more relevant, in the Cycladic long before those dates. The article is vague but unless you're positing some common steppe origin for both I don't see how it's that relevant. It's not only about violin figurines, but also about how the whole settlement was built. Poles have some strange affinity to BR2 and this shows that indeed there were a very physical interactions between CWC and Bronze Age Hungarians. My comment about Satsurblia is because that's what Ariel used in his model (that I was reproducing) and, honestly, it looks like a strange choice for a source of Mycenaean Greeks. Armenia_EBA seems a much better choice by comparison. And you need a big impact of a CHG-rich population from the EBA to account for that 18.7% Satsurblia in his model. So I expected you to complain about using Satsurblia rather than about using Armenia_EBA. With Bulgaria Neolithic or Chalcolithic samples Yamnaya would probably disappear, logically. But let's wait for that to check it. As for Y-DNA, indeed one sample is far from enough. But together with the Mathieson data I wouldn't expect more than a random R1b popping up here or there. If this was an invasion of steppe R1b (or R1a) guys it would show in the autosomes. Not really. If Northern Europe is only 40-50% steppe with low populations in the north, it'll be diluted more in the Balkans and the Aegean. Hold off for more males. Going by Dave's PCA Minoans look sort of Jordan_EBA shifted, relative to Neolithic Europeans/Greeks/Barcin. As does Anatolia_BA, relative to Anatolia_ChL. Apparently both regions were somewhat Jordan_EBA-shifted, just like ancient Egypt as well. And the Myceneans look Europe_LNBA shifted, relative to Minoans. They don't look Armenia-shifted. At least judging from that PCA, I yet have to read the paper in detail. You don't think R1b was in central Europe at the time prior to the alleged Mycenaean immigrants? Can you run one of these models looking at Bell Beaker genomes? "As for Y-DNA, indeed one sample is far from enough. But together with the Mathieson data I wouldn't expect more than a random R1b popping up here or there. If this was an invasion of steppe R1b (or R1a) guys it would show in the autosomes." But there is EHG, which was NOT there previously. Whether you want to use a term different from "invasion" go ahead. Perhaps it was female mediated gene flow. Whatever it was, the later genomes are EHG shifted, you can't debate that. That chapter is online too. @Davidski. PCA will look really busy with all the Mathieson 2017 data, the Baltic_BA and the Sidonians, etc. Re: using nMonte, I have some problems with that method too, but in a way it's better to use nMonte which can "look" over 10 dimensions than us just looking over the largest 2. Might be nice to looks at detailed Fst scores at some point, see if the particular regional continuity apparent in e.g. Bell Beaker Fst is obvious here as well. @Alberto, interesting that Hungary_N works in these nMonte. I'm not so sure about using it over the Minoans or Greece LN, in models, but it does seem perhaps like the level of EHG in Mycenaeans is low enough (approx 5%?) that shifts in the EuroHG substrate into EN-MN-CA European farmers could actually matter to models here, where it doesn't suffice elsewhere. (E.g. Hungary_N having ancestry from slightly more EHG shifted Koros / Iron Gates type HG, compared to Atlantic Neolithic). @Chad: "I dont think using Armenia EBA is a wise choice. It isn't very proximate compared to the Anatolian BA." A thing for me here is it seems fairly likely from the genetic distances between Armenia and SW Anatolia that Northern Anatolia in the late Bronze Age may have had a pretty different position from SW Anatolia. Or worse, for us, the landscape could have had a patchily admixed set of groups who we're not catching. I mean, I don't know if I'd want to bet that the gap between the Mycenaeans and Armenia_ChlBA will remain unfilled as more samples from ancient Anatolia accrue. Plus, I guess we can object to not using Anatolia BA on the grounds it's proximal... but hard to reject Armenia EBA for being too far from Peloponnese while using Steppe EMBA / MLBA. "When the West meets the East: The Eastern periphery of the Bell Beaker Phenomenon and its Relation with the Aegean Early Bronze Age"
"Seaborne Contacts between the Aegean, the Balkans and the Central Mediterranean in the 3rd Millennium BC - The Unfolding of the Mediterranean World"
hahahha, I just saw your comment. We posted that at the same time. Sorry I have been able to access the article, any idea on the exact timeframe of the samples? Simon, how do u know Minoans were non IE? Minoans are clearly CHG shifted compared to farmers: 35% Copper Age Anatolian and 65% Greek farmer is probably the correct mix. Myceneaens have additional 10-20% steppe admix. I haven't I mean, does anyone know the timeframe of the samples? The problem is that we have Yamnaya Y and admixture in the Balkans before this, so that source is covered. The biggest problem is that evidence Kura Araxes even reached the Konya Plain is minimal. Clear to the Aegean? Very unlikely. Also Z93 in the Balkans. @ArchHades "Simon, how do u know Minoans were non IE?" The Minoan language is attested in writing in the Linear A script (which is the same phonetic system as the Linear B script in which IE Mycenaean Greek was written). Also, Minoan is transcribed phonetically and descriptively in Akkadian, Mycenaean and Egyptian sources, and the pre-Mycenaean toponyms and proper nouns of the Minoans are not in accord with the kinds of toponyms used by IE peoples. @ArchHades "Simon, how do u know Minoans were non IE?" continued . . . There is also strong evidence of a non-IE substrate in the IE Greek language manifesting in non-IE words in categories unlikely to be mere loan words, and in some orthography (i.e. spelling) and grammatical nuances attributable to a substate influence in IE Greek. Marvellous that the ony Y haplogroup comes from an area that still spoke eteocretan in classical times. It's not so much about the specific culture to me but just whether there was a general expansion of Armenian CA-BA autosomal structure either along a route through Anatolia avoiding the south west. Or just post dating the samples they have, which are about 1000 years before the Mycenaeans (tend to be earlier than their Minoans). "Going by Dave's PCA Minoans look sort of Jordan_EBA shifted, relative to Neolithic Europeans/Greeks/Barcin. As does Anatolia_BA, relative to Anatolia_ChL. Apparently both regions were somewhat Jordan_EBA-shifted, just like ancient Egypt as well. And the Myceneans look Europe_LNBA shifted, relative to Minoans. They don't look Armenia-shifted." It is interesting that one model of the Minoan immigration suggests that (on the basis of EM pottery) that the Southern Levant--Chalcolithic to EBA may have been the source of Minoan immigrations to Neolithic Crete. I didn't understand your first post about BB in Central Europe and their relationship to Mycenaeans. As for the second, not sure if you're arguing that ~5% EHG admixture (and female mediated?) strongly suggests that Greek language came from the steppe. Doesn't sound like a strong argument to me. Also about EHG not being there before, did you miss the Mathieson paper? The expansion of colonies from Anatolia into Thrace is well documented. Mycenaean Greeks are probably, largely, a product of such movements (though it can be more complicated, with Adriatic influences too). And of course it's not a coincidence that Minoans don't have this extra EHG admixture. There's no evidence that Minoans ever passed through Thrace. They look like they should, just like Mycenaeans do. Some scholars have suggested that Minoan or the language of the Linear A scripts was related to Luwian and IE. Im no expert but i dont buy it that the Minoan language is known throughout the academic world to be non IE. See also "Discussion: Are the Origins of Indo-European Languages Explained by the Migration of the Yamnaya Culture to the West? ", to appear in the last issue of EJA - published online 5 days ago, see here: https://doi.org/10.1017/eaa.2017.35"
My answer to that question would be "no", or at least, "we don't know enough to know." The earliest historically attested IE languages in Western Europe are Celtic. Linguistically, the Celtic languages were so similar to each other that a very late Bronze Age (ca. 1300 BCE) or even an Iron Age (ca. 800 BCE) time depth is supported, not a time depth of 2500 BCEish that would be supported by a Yamnaya source for Indo-European languages in Western Europe. If the Yamnaya did bring IE languages, it is almost certain that those languages went extinct when Celtic (and perhaps also Germanic and Italic) languages replaced them in the early Iron Age or very late Bronze Age. We have very solid evidence that the Corded Ware Culture and its successors with IE, but the CWC and the Yamnaya culture to the South are very cleanly sorted (admittedly not absolutely completely) by Y-DNA lineage with CWC to the north as a derived version of R1a and the Yamnaya to the south as a derived version of R1b. The time depth of that split is considerable and born out by the fact that this sorting exists even in Mesolithic ancient DNA. Neat lineage sorting despite a lack of any obvious physical barriers between the two populations suggests that there was a cultural divide between the two populations that kept them separate and language differences often accompany that kind of cultural divide (something noted by Anthony in Horse, Wheel, Language). Yamnaya's northern border zone was IE, but its southern border zone was probably an ancestor of the modern Caucasian language families of one sort or another (and hence non-IE) based on the attested languages of highlands peoples in that region at that time. It is quite plausible that the Yamnaya for whom we have pretty much zero attested linguistic evidence of any kind (even accounts from the closest literate people) could be non-IE, and the fact that a fair amount of Yamnaya technological innovations e.g. in metallurgy were probably derived from people in the Caucasus region combined with lots of bride exchange with that region could be an indication that they viewed the Caucasians as an elite culture to emulate in a critical formative time period of the culture. We know that between the R1b Yamnaya culture and the first attested cultures in the same region where the Yamnaya lived there was a dramatic shift from an R1b dominated people to an R1a dominated people that very likely was accompanied by language shift and which could have been a push factor for R1b people to migrate to the West. Certainly, there are myriad examples of people with quite similar autosomal genetics speaking different languages and even sharing different language families. So, it is certainly entirely possible that the Y-DNA R1b Yamnaya spoke a non-IE language, migrated to Western Europe when R1a men conquered their turf, bringing their non-IE language with them which expanded in some areas where the Bell Beaker culture was present, and then was replaced by the Celtic languages around the time of Bronze Age collapse with only modest demic impact (which would be hard to see anyway in autosomal genetics since Yamnaya and Eastern IE autosomal genetics and mtDNA are very similar even though the Y-DNA is very distinct), with the possible relict exception of Basque and a few of its Vasconic neighbors that went extinct shortly after their fragmentary attestation in the Iron Age. These Vasconic languages would also have provided a fairly uniform substrate for Celtic languages when they arrived and replaced the prior languages, which would explain relatively low levels of fragmentation in Celtic. And, indeed, Celtic languages show lots of linguistic affinities for Central/South Eastern European languages like Serbian which aren't far from the putative urheimat of the Italic-Celtic languages, while with a deeper time depth one would expect less similarity. In the alternative, the Yamnaya people were IE and kept their IE languages in places where there was population replacement all along, displacing first wave Neolithic languages, but in Iberia, where they introgressed less strongly (perhaps because population densities were higher and the existing civilization was more advanced) you saw something akin to the Romans who conquered Greece but then ended up speaking Greek rather than Latin in the Eastern Roman Empire. The Iberian Yamnaya men may have adopted the languages of their wives and hence Basque and other Vasconic languages may be derived from the first wave Neolithic languages of Iberia, but persisted in the face of moderate levels of Yamnaya introgression while other first wave Neolithic languages went extinct. This scenario is supported by the relative continuity of population genetics in the Iberian area which is the only place where Vasconic languages are actually attested and would also explain why Basque is a language isolate because the time depth of its connection to the Anatolian non-IE languages (also pre-Minoan) where it has its source is so great and so completely replaced first by Minoan-like people and then by Hittites, and then by Hellenic people and then by Turks and Arabs and Persians. Both historical linguistic narratives are supported by the current evidence. The BA Anatolians are shifted towards a pop between Iran CA and Levant N. not close to Armenia EBA. Quite far off. Bronze Age Balkans do have Z2103 and Z93. This is from the steppes. Would be good to see the ancestry estimates for the Mycenean X chromosome. "Some scholars have suggested that Minoan or the language of the Linear A scripts was related to Luwian and IE. Im no expert but i dont buy it that the Minoan language is known throughout the academic world to be non IE." While there are always people in the academic world who take heretical positions, the by far majority view is that Minoan is not IE. Some more evidence with a bit of flesh on it: We do know that the pre-Hittite language of a lot of the territory conquered by the Hittites, sometimes called Hattic, was non-IE because it is very well attested since it continued to be used as a religious language by literate people long after it ceased to be a living language with the common people (much like Sumerian, Latin, Hebrew and Classical Arabic), so we can study it in depth. Some of the longer phonetic examples of Minoan are found in magical rituals of the Minoans copied by Egyptians. And, those Minoan magical rituals sound very much like Hattic phonetically, a population to which we already know that Minoans have strong cultural and genetic ties. Also, while there are lots of parts of Linear A that we haven't deciphered, most of it amounts to lists and accounting and welfare program and farm program records of Minoan government officials, so we've pretty much figured out the Minoan number word system and some of the words for farming products and quite a few proper nouns (that have Mycenaean cognates that sound the same). And, basic words for numbers and farming products are among the words which are most resistant to linguistic drift. But, those words in Minoan have no connection to IE words for the same things which show particularly strong correspondences across language families. Minoan words also put together consonants and vowels in characteristic patterns that don't fit the rules in the IE languages of that vicinity about how you put syllables together in words that sound like real IE words. They break those rules of neighboring IE languages. Admittedly, we haven't totally cracked the Minoan written language and we have no tape recordings from that time period (although phonetic reconstructions in other languages come close). But, we do have writings from people who spoke IE languages and Afro-Asiatic languages who heard Minoans speak and thought that it was extremely different from their own languages. The absence of steppe ancestry in Anatolians and Minoans further supports the non-IE hypothesis, even though standing alone it isn't convincing by itself. And, the dilution of steppe ancestry in Anatolian IE speakers over time with locals theory advanced by the paper is completely unconvincing. We also have good reason to believe that the IE Hittites were very much a tiny minority population linguistically in a sea of non-IE speakers based upon detailed written accounts in Akkadian from trade colonies near one of the two original Hittite cities, and metallurgical innovations for processing iron ore are closely tied to a time period starting about 2000 BCE which corresponds very closely in range to the historically attested Hittite territory alll of the way through to Bronze Age collapse which suggests that this technological edge which was kept a closely guarded secret was important to Hittite expansion (something that Bronze Age writers stated expressly talking about military issues in correspondence) and which suggests that IE languages in cultures closely related to the Hittites were not widespread ca. 2000 BCE even though they would have to be nearly ubiquitous for Minoan as an IE language to make sense. And, while there are a couple IE languages attested in specific regions of Western Anatolia pre-Hittite, most of the attested Anatolian languages, like the Romance language, arose after the collapse of the Hittite language when Hittite fragmented into daughter languages the way the Latin did without a central governmental connection to counter centrifugal forces of schism. @Chad, on Davidski's PCA rather than the paper. Levant very minor, shift mostly CHG direction. I have been looking at the Global 10 data that Alberto provided at 1:23 AM on 3 August. If this data is reliable, then similarity between the Mycenaeans and the Steppe peoples is shown mainly by Kotias KK1 (Caucasus Hunter Gatherer) with 21 – 24% in most of the Mycenaeans. However, this could have come from the east rather than the north. They have only 0 – 5.9% of Karelia HG (Eastern Hunter Gatherer), the more definitely north-east European element. Even this might not really come from the north. Iran Hotu I1293 from the south-east corner of the Caspian dated to around 9000 BC has 12.2% Karelia HG. In addition the Mycenaeans have 0 Loschbour (Western Hunter Gatherer), while almost all the early Steppe people have a considerable amount of it, 8.5 – 19.4% in the case of Yamnaya. In general this data provides strong evidence that Mycenaean Greece had received immigrants from the east, but very little that immigrants had come from the north. "and small "steppe", which was probably already admixed in copper age Balkans"
That's a load of #$%@ but that's what I expect from idiot posters like you. Myceaneans are clearlly a Minoanlike+Steppe mix. How they are modeled changes their Steppe score. If they are Modeled as Minoan+Steppe, which is the most realistic model, they get 20% Steppe. The Steppe in Mycenaeans is a recent arrival from the north that arrived around when Steppe arrived in Northern Europe. 'Steppe has been in the Balkans since the Copper age' is just you trying to muddle down the significance of Steppe in Mycenaeans and lack of Steppe in Minoans. You know full well the Copper age Balkan genomes with Steppe ancestry were *outliers*. The sudden appearance of Steppe ancestry in Greece coincides with the sudden appearance of Steppe ancestry in Croatia. The Croatian Bronze age genomes in Mathieson 2015 are contemporary to these Myceaneans. They carried 30% Steppe ancestry, compared to 10-20% in Myceaneans. And Rob there's no point to putting Steppe in quotes. The Steppe in Myceaneans is infact from the Steppe. There were no EHGs in the Mesolithic or Neolithic Balkans. Nothing can explain EHG ancestry in Bronze age Croatia, Bulgaria, and Greece without migration from the Steppe. I'm surprised you're still trying to water down the importance of Steppe ancestry. Even after your theories about R1b M269 in Balkans and local HG ancestry being confused with Steppe ancestry have been proven wrong you're still going at it. I respect that. NOT! I don't know what it is you have against everything Steppe. Did Yamanya people sacrifice your puppy dog during a time machine vacation or something? The output provided my Alberto is only reliable if it can be corroborated by more sophisticated and "by the book" methods. But this doesn't appear to be the case, because these other methods do find substantial admixture from the north in Mycenaeans, particularly from Europe LNBA and Steppe MLBA groups. I'll post some info about that in a new update soon. I always enjoy reading the perspectives of the world's most intelligent person. Apart from sheer natural intellect, we are also blessed that you share with us your deep-seated familiarity with the region. Is this study still a work in progress? Are there results from other Mycenaean samples coming soon? Of course, as the technology and methods improve, more samples will be sequenced and published very soon. "I always enjoy reading the perspectives of the world's most intelligent person." You're welcome. Whenever you say something stupid again I'll let you know. You know, I know, Alberto knows and Chad knows how it reached Greece. "WoW I actually espected ancient Greeks to turn out as Poles and Germans, who later on mixed with Lebanese slaves during the Byzantine period becoming modern Greeks. :-/"
No one acquainted with ancient Greece would have believed the Nordicist joke that they were blue eyed Germans. Oh hey, here's to this study refuting that laughable idea! So far we have just four Mycenaean samples: three commoners and one elite female. And even they clearly show steppe admixture. The source of this admixture isn't a mystery. It's the Sintashta-like population that has already showed up in the ancient DNA record in Bulgaria. Ancient DNA from elite Mycenaean males will confirm this. You will see elevated steppe admixture and R1 Y-chromosomes in these samples. "For now, the most sensible explanation for extra EHG over and above of Armenia EBA is that already found in Copper Age East Balkans, like Varna. Fairly small-scale, exogamy type stuff." None Mycenean's EHG ancestry is from Armenia EBA because Minoans had no Armenia EBA ancestry. Myceneans are clearly mostly Minoan-like with some additional Europe LNBA-like ancestry. Only one out of five Varna individuals had EHG ancestry! Stop acting like Steppe ancestry was widespread in the Copper Balkans. "Fairly small-scale, exogamy type stuff." That's the type of explanation people give when they're too lazy to try to try to determine what migration caused it. Whoever gave Myceneans their EHG ancestry had a lot less EHG than Yamnaya. Whatever Myceneans Yamnaya score is you've got to increase it to get an idea what percent of their ancestry recently arrived from the north. You've got to put Myceanan's minor Steppe ancestry into context. Before 3000 BC Steppe ancestry was restricted to the very eastern edge of Europe. Every other part of Europe was dominated by EEF and WHG ancestry. Not even HGs in Eastern Ukraine were EHG. This means Myceaneans had ancestry from a very very specific region. Could it really be a coincidence IE speaking Myceaneans had ancestry from this tiny region while non-IE Minoans didn't? I bet you'll give the same explanation when we get ancient DNA from Italy and Etruscans come out 0% Steppe while Italic speakers come out something 30% Steppe. "The source of this admixture isn't a mystery. It's the Sintashta-like population that has already showed up in the ancient DNA record in Bulgaria." How do we know whether the steppe ancestry in the Greeks is Yamnaya or later Bronze age Sintashta related? If its Sintashta related its odd that this ancestry would make it to Greece but oddly not Iran or India. According to the 2016 Lazardis paper the steppe ancestry in the middle east and South Asia is not Sintashta related. However, we do notice that the model 79%Minoan_Lasithi+21%Europe_LNBA tends to share more drift with Mycenaeans (at the |Z|>2 level). Europe_LNBA is a diverse group of steppe-admixed Late Neolithic/Bronze Age individuals from mainland Europe, and we think that the further study of areas to the north of Greece might identify a surrogate for this admixture event – if, indeed, the Minoan_Lasithi+Europe_LNBA model represents the true history. Who do you think they're talking about? To me it seems like they're talking about this guy and his posse, because he's not much different from the average Europe_LNBA sample, no? How does the Multi Cordoned Ware Culture fit into this picture. Could they be the Sintashta/Srubnya like people who migrated to Greece ? I think we need to consider that the rise in Minoan influence from middle to late Helladic also lent more Minoan-type ancestry to Greece. We may very well see that between 2000-1600BCE that people in this area were 20-30% steppe-like, or more, like the elite Cretan. We need more data here, but Myceaean from the East still seems very doubtful to me. The obvious origins of Minoans is local Neolithic. So whatever link they have with Myceneans is from the common Neolithic substrate, and of course, on going cultural exchange. Minoans are shifted towards both CHG/Iran_N and Levant_N compared to Greek_N. Clearly, a foreign population was involved in their ethnogenesis. If you see this https://www.google.com/search?tbm=bks&q=origin+indo+iraninians&oq=origin+indo+iraninians&gs_l=psy-ab.3...580.6532.0.6714.32.26.2.0.0.0.333.3998.0j6j8j3.17.0....0...1.1.64.psy-ab..13.3.675...0.zNoJjiv89Oc. you'll read the kind of stuff you wanna yhear. Mycenaeans are shifted far more and by greater number of groups (2). One other thing about this is (based on my limited knowledge of the linguistics) is a particular relation between the Greek and Armenian languages. They are invariably on the same branch in the computational phylogenic models (and also Warnow and Ringe's non-computational model). If we have a migration out of the east, to Greece, of linguistically related people at about a proximate 30-40% into an Aegean substrate then that makes sense in a fairly simple way. Otherwise it seems like we would be pushed towards a model of more recent Armenians as also having ancestry from a Balkans source+the Armenia BA; I'm not sure how well that works, and I would suspect from PCA not as well as Mycenaeans having Armenia_BA ancestry, but I'm sure people can test. It's still pretty mysterious to me why the early Armenian Chalcolithic and Bronze Age are like they are, though, rather than just on a Anatolia_N to CHG cline. Why are they EuroHG shifted from positions on this cline? Early ancestry from steppe / North Caucasus? I m not through reading the full contents of the paper but I think I have an answer to your puzzle. It maybe that the source is coming from South Central Asia which is Iran_N like but more ANE shifted, a bit like IrAn_Hotu. Also have a look at extended fig 2 d, in the allele sharing graph of test populations between Mycenaeans and Minoans, it is Iran_ Hotu that tilts most towards Mycenaeans . I have been waiting for this study for ages! I don't beleive I have actually missed this!! Bad timing to be on holidays.. So Cypriots very close to Bronze age Greeks! I am goingt to spend the day reviewing the paper and come back with comments.. The truth is, Anatolia's landscape is quite convoluted, with numerous geographical corridors running across its length and this in all likelihood would have made it a zebra featuring stripes of genetic variation come 2000BC. At the end of the day, we have to remind ourselves that we're dealing with surrogates and stand-ins, not necessarily actual sources of admixture. The Minoans were best modeled as mixtures of Anatolia_N and either Anatolia_Chl or Armenia_BA. The fit was slightly better for Armenia in the 2-way model. In the 3 way, it was the same except w/addition of Levant. What if some (to-date) unsampled west Anatolian population was the culprit-----one whose CHG content was intermediate between Armenia and Chalcolithic Anatolian samples? Additionally, what if the "start line" Neolithic Cretans were similar to Neolithic Peloponesians from Mathieson et. al. 2017, featuring some Levant-like admixture? ""Modern Armenians are Armenized Mesopotamiams who went North to escape the moslem expansion."" Lol. You simply don't know what is the difference between historic Armenia and modern Armenia. Do You know that one of ancient Armenian capitals was close to modern Diyarbekir which is basically in the neighbourhood of Levant. And until now we don't have any sample from South East Turkey to see what type of population was living there. We have samples from South Anatolia ( Tepecik Ciftlik ) and guess what? they are already had a lot off of that Levantine shift which in reality is not a real Levantine but somewhere from southern parts of modern Turkey. Comparing Minoans to LN_Greece could be incorrect because it assumes that Crete Neolithic was similar to mainland Greece Neolithic. Which is not true because Peloponnese Neolithic already had that slight CHG shift plus a lot Levantine shift. So which is more probably that Crete Neolithic is close to Peloponnese or to mainland Greece? J2-M319 is from Taurus/ North Syria / Cilicia region at best. It moved with coastal lines. While J2-M67 had a more northern migration. I guess the bulk of migration of M67 occurred via NW Anatolia to Europe because we also have J2-M67 in Hungary LBA/IA. And modern Thrace had a hotspot off J2-M67. ***Btw, regarding what I wrote about Levant-shifted Peloponesians(4 of them or so) in Mathieson 2017: I am surprised people here forgot about their existence when they couldn't be more relevant to the discussion. Perhaps they were a dead-end population in mainland Greece, but it's not impossible Neolithic Crete resembled them genetically considering its proximity to a potential "Levantine" genetic conduit running along Anatolia's southern coast. I would SLIGHTLY disagree with you, again, because those Levant-shifted Peloponesians from Mathieson's paper were likely a genetic dead end/outlier. The Neolithic Peloponesians from this paper were no diff to other Neolithic Greeks. But, yes, I do have a strong suspicion about Crete being part of the Levant-Cilicia-AkDeniz_Region coastal interaction network. The J2 theory makes sense. I m not through reading the full contents of the paper but I think I have an answer to your puzzle. It maybe that the source is coming from South Central Asia which is Iran_N like but more ANE shifted, a bit like IrAn_Hotu. This Minoans are very similar to Peloponnese Greece. It could have potential repercussions on the Etruscan origin also. Why You think they are dead end? Minoans aren't similar to any Greeks. Have a look at my plot. "You've got to put Myceanan's minor Steppe ancestry into context. Before 3000 BC Steppe ancestry was restricted to the very eastern edge of Europe"
Look dude. Go educate yourself, because you're talking shite. By 3300 BC steppe ancestry was down all the way to south Bulgaria. And 'the context' of the minor steppe ancestry in Myceneans is exactly from this sort of area and time, as per the study " we think that the further study of areas to the north of Greece might identify a surrogate for this admixture event", and it co-occurred with arrival of Chalcolithic Balkan groups, not imaginary "Yamnayans". For some reason I thought the ones in Mathieson clearly predated the sample in this paper, but after double checking the supplement, I see they do not. That changes things, I guess! Still, recall that these Peloponesians formed an outgroup relative to other Neolithic Greeks, Anatolians and Europeans. If these kinds of Peloponesians were the Mycenaeans' pre-Chalcolithic substrate, wouldn't Laz's guys have noticed something in the modeling? You're right to point out steppe ancestry in Bulgaria(Varna outlier and the other Bulgarian Balkan Chalcolithic outlier come to mind). The thing is, look at how proximal it is to the western steppe corridor. It's effectively the south-western terminal. In more recent history it ensured its status as a landing ground for various steppe cultures---Sarmatians, Huns, Avars, Bulgars, Pechenegs, Rus raids, Mongols, etc. Perhaps early steppe admixture in Bulgaria is a result of migrants basal to the Yamnayans. "I bet you'll give the same explanation when we get ancient DNA from Italy and Etruscans come out 0% Steppe while Italic speakers come out something 30% Steppe. " I don't know. Etruscans came after Villanovans, iron workers related to Urnfield culture. And they probably mingled. Of course steppe admixture reached Bulgaria via the steppe. but it is not via mechanisms generaly envisaged by the more 'populist' literature on the I.E. question. But obviously steppe and EHG is just one part of the story. "I don't know. Etruscans came after Villanovans, iron workers related to Urnfield culture. And they probably mingled." Before genetics became a hobby of mine I used to think neighboring ethnic groups mixed a lot. Well, then I learned it's pretty rare. I've seen so many examples of genetic isolation along ethnic lines. So I do think non-IE Etruscans will come out 0% Steppe or a lot lower than what Tuscans have. I know some people will think I'm racist for saying this: but just look at their art, they depict themselves usually with brown skin just like the Minoans did. EEF, and probably originally Steppe people, most likely had mostly brown skin. But Bronze age Steppe-rich people had pigmentation similar to Northern Europeans. Steppe-rich admixture from north of the Alps would have probably made Etruscans significantly lighter. Chang et al have Armenian-Greek split from I-A c. 3500 BC and the Armenian - Greek c. 2200 BC. This figures ring sense from what we're seeing, the issue is which way to put it round ? IIRC, it was moreso Armenia Chalcolithic than EBA which had ~ 10% EHG admixture. I;m not sure how significant it is - it could have arrived in late Mesolithic or Neolithic. Maybe the next Armenian paper will clarify. Minoans certainly arent local. They're not close Greek N, Boncuklu, or Levant. They have the same process going on, but with the northern ancestry. Minoan>Late Helladic would only bring them closer. It needs to be considered. We need samples that stretch 3200-1300 BCE. I dont think Mycenaeans have just two mixes from Greek N starting point. Here's my latest Fst matrix. There was a large migration spreading the ancestry CHG/Iran and Ydna J in the eastern Mediterranean during the Bronze Age and this needs to be further investigated. Note that the Egyptians Schuenemann et al. 2017), Levantines (Lazaridis et al., 2016), Anatolians, and Caanites (Haber et al., 2017) were found to possess this mixture from the Bronze Age. Now we have the southern Greeks as well. The shift of Minoans and Myceneans on PCA with respect to CHG/Iran may be explained by the mix with people from this massive migration. Mathieson et al. (2017) also noticed this shift in some samples from the Balkans.